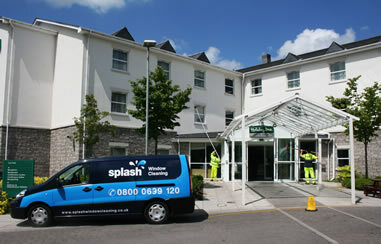 Splash Window Cleaning has been established since 2002 and has built up an excellent reputation for providing consistently high service standards to all our clients. Locally and nationwide combined we have in excess of 1500 client’s, some of which are multi sites and our contracts range from residential blocks, retail outlets and schools through to many blue chip, private commercial companies. Window cleaning is potentially one of the most dangerous activities undertaken by any cleaning service company. Our record for safety is 100% and we are proud to have been awarded with the prestigious SAFEcontractor Accreditation award. We hold a total of £2 million public and employers Liability, we have developed the business to fully comply with the 2005 Health and Safety Working at Height Regulations. To avoid working at height wherever practical and reasonable, almost all external window cleaning to heights of 40 feet is carried out using pure water fed pole technology systems. These facts combined, have enabled us to strive in the current market. We are extremely health and safety conscious and carry out full risk assessments where necessary.